Wolcott area floods in KCK – Welcome to Wyandotte Daily! The approach to I-435 over the Missouri River, in the Wolcott area of Kansas City, Kansas, was under water about 11 a.m. on Saturday, March 23. The Missouri River was listed in moderate flood stage above Parkville, which includes Wyandotte County. 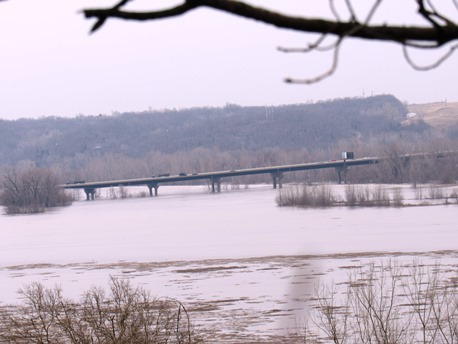 Water surrounded the I-435 areas next to the Missouri River on both sides of the state line. The river is projected to rise a little more, to 35.2 feet, until it crests Saturday night. This photo was taken from Wyandotte County Lake. The Missouri River is on the left and the land surrounding it is to the right in this photo of I-435 on the Wyandotte County side, looking east. 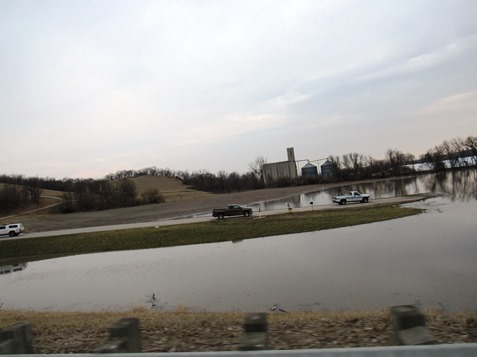 A grain elevator and business on Wolcott Drive near 105th was flooded on Saturday morning. At 11:30 a.m. Saturday, flood waters did not cross south of Wolcott Drive in this area. 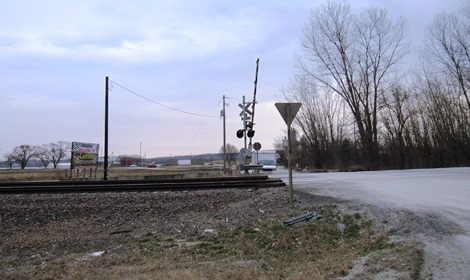 KanDrive, at www.kandrive.org, reported that K-5 highway was closed from the Lansing city limit to Eisenhower Road in Leavenworth County because of flooding. 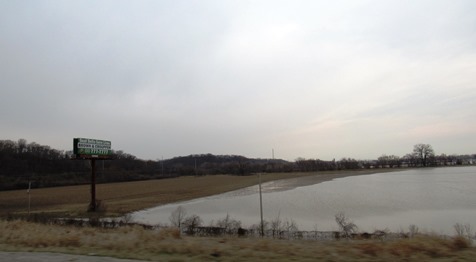 A view of a flooded area to the east of I-435 in Wyandotte County on Saturday morning. The entrance of Lakeside Speedway on Wolcott Drive on Saturday morning. A large area was flooded from I-435 south of the Missouri River in Wyandotte County, looking west, ending a little before the Wolcott Drive area. 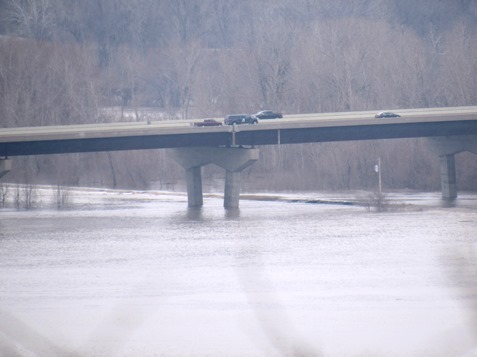 A view of cars traveling north on I-435 over the Missouri River in Wyandotte County, with flood waters underneath. I am feeling so sorry that it’s happening again. My family and lots of my neighbors were in the ’93 flood there in Wolcott. And when I see things like this it brings back lot of bad memories. The loss of homes in Wolcott.